No freezing up here. 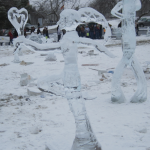 Artists carve into ice at Frankenmuth Snowfest. Patricia Ryan Madson’s Improv Wisdom is one of those little gems of a book that’s opened unfortunately after you discover the script that you’ve been taught to follow doesn’t knock ’em dead.She writes of her obedience to painting inside the lines, following the masters, and receiving the rewards from it with a regular paycheck for being an assistant professor, a nice house, and good benefits. Then she’s denied tenure at Denison for “lacking intellectual distinction.” She’s praised for her service. She’s compiled a nice resume in her search for validation. But she’s let go for failing to create her own work. She wasn’t using her own voice and vision. She was validating the work of others but not her own. She vowed to stop doing things simply to impress others and trust her imagination. Two years later Stanford hires her to lead their undergraduate acting program. She confesses that Improv Wisdom required nearly twenty years to write. She showed up every day at her desk to write, said yes, yes, yes, and still needed two decades to finish. Steven Pressfield writes in Do the Work that if you got a head, you got a voice of Resistance inside you. The Real You must duel the Resistance You. I have to believe the voice of Resistance has an evil twin who just says, “You’re on.” The public’s watching so be careful about using your real voice. You have an ordinary mind and an ordinary voice so why would anyone want to read what you have to say. A friend of mine wrote to several infamous prisoners many years ago, hoping they would answer his letters. He wanted to collect the letters. One of the letters he received was from the serial killer John Wayne Gacy. The “Killer Clown” was executed for killing 33 people. Gacy’s letter was unforgettable. He proclaimed his innocence while writing about himself in the third person. His voice, and deranged mind, were very evident in the letter. The Killer Clown wasn’t trying to imitate Hemingway. He was weirdly imitating himself. Then he showed me another letter from a friend of his that was more fascinating. It was a remarkable story about a business failure that ruined him. The letter writer’s voice was powerful, authentic, and literate. It was one of the most mesmerizing letters that I’ve ever read. I just kept saying that he should write a book or make a movie of his story. My friend said he tried but his book was turned down. Why? I asked. He wrote too fast. A familiar problem. The voice in the letter became anxious to make a good first impression with every word when he sat down to write the story. He didn’t trust using the remarkable voice in his personal letter. Books mean going public with your voice. The fear of public speaking is well known. We’re constantly told how to improve our public speaking. Follow these rules. Imitate the best. The fear of public writing, hidden by going public in someone else’s voice or trying too hard to impress, is hardly ever mentioned or even recognized. Improv Wisdom discusses the fear of public speaking. There’s nothing about public writing, which is really all about thinking for oneself in public. Does the ordinary mind have the right, and confidence, to expose itself in public, or must it imitate the masters, and paint, write, speak, think always between the lines? I think the ten thousand hour rule has as much to do with telling the Voice of Resistance to go soak its head as it does with mastering a craft.